The mother of the 14-month-old child posted bail and was released from jail according to jail records. The child is stable and currently in a hospital in the bay area. According to the mother the drugs did not belong to her. 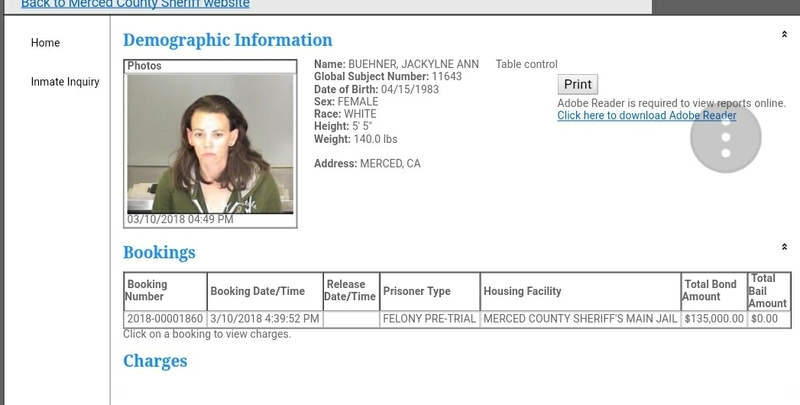 On March 10, 2018 at 9:41 A.M., the Merced Police Department Dispatch Center received a 911 call from Jacklyne Buehner (34 yrs.) The mother who stated that her 14-month-old daughter had ingested some methamphetamine. Merced City Fire, Police and Riggs Ambulance responded and found the child in distress. EMS rendered aid and transported the child to Mercy Community Hospital for treatment. The child is in critical condition. Merced Police Detectives responded to the scene and ultimately arrested Buehner for Child Endangerment. Merced Police are asking anyone with any information regarding this crime to contact Detective Horn at (209) 385-7739, or the Merced Police Department Tipster Line at (209) 385-4725. The public can send information via anonymous text messages to police department by dialing “TIP411” (847411) and including the word “Comvip” as the “keyword” in the text message.